The Center for Infrastructure Engineering Studies invites the campus community to a guest lectures given by Dr. Gaurav N. Sant from University of California, Los Angeles on Thursday 2/21/19 at 2pm in 317 Butler-Carlton Hall. 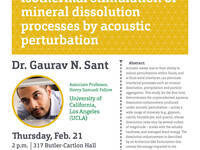 The topic of the seminar will be: "Isothermal stimulation of mineral dissolution processes by acoustic perturbation." See website for further details. Refreshments will be served.